John Maxwell was born in Shelby County on March 8, 1875. As a boy, “mad dog” scares were a common occurrence and one spring, dogwood trees filled his community with their unique scent. During that same season, a “mad dog” outbreak occurred in the community and for the rest of his life, the smell of dogwood trees would bring Maxwell horrific memories of local men running around with rifles shooting sick dogs or dogs who were unlucky enough to act a little too strange. He attended public school in Temple before attending Baylor where he studied law and befriended a classmate, Alva Bryan. In 1910, he was crowned King Cotton at the Cotton Palace Expo. He founded a law firm with Brother Alva Bryan. 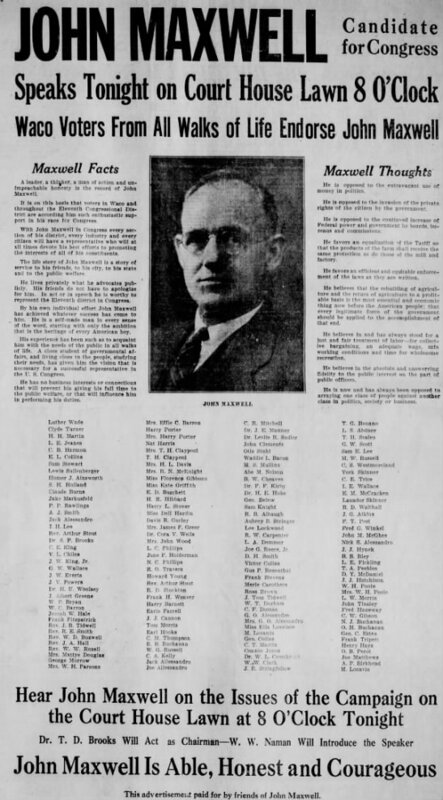 Maxwell was a leader for Waco’s Young Men’s Business League. 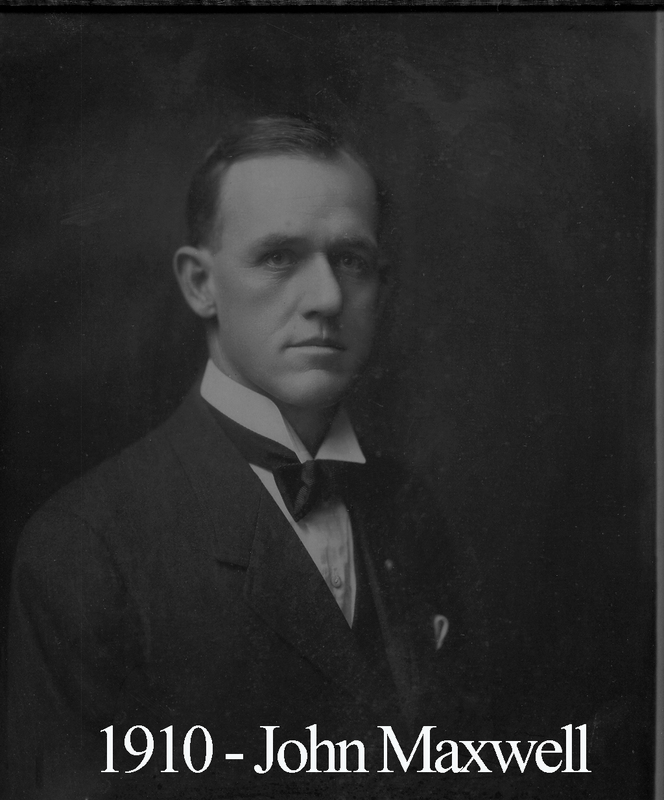 Maxwell was Waco’s City Attorney from 1913-1918 and the first president of the Waco-Mclennan County Bar Association. He was elected to the State Legislature in 1909 and was the head of their education committee. Maxwell was also Assistant Attorney General for the state of Texas. After his death, fellow state representative Murray Watson Jr. offered a unanimously accepted resolution to the House recognizing and paying tribute to Brother Maxwell at the 55th session of the Texas Legislature. As a Mason, Maxwell’s resume is equally impressive. Among others, he held the following offices: District Deputy Grand Mater, Right Worshipful Grand Orator, and all the stations of the York Rite Chapter and Council as well as being a 33rd degree Honorary Inspector General of the Scottish Rite. During his year as Master of Waco 92, our famous Downs building located on the Square burned and Maxwell oversaw the plans for a new temple at 8th and Washington which is still there today. He died November 24, 1957. “The goal of Freemasonry is the discovery of the truth. To that end science, philosophy and ethics are brought into service. The aim of truth is the establishment of social justice among the peoples of the earth. Many men are of many minds as to what is social justice, but when we find the truth, then shall we know. It is an evident fact that the mass of folks cannot all know what is wisest in government and society. They have neither the time nor the means to devote to its study. The problem of earning a livelihood lies heavy on their shoulders. The hard facts of economic need are continuously present with them. We have preached incessantly through the years the doctrine of equality; we have expended our wealth in a program of popular education; we have championed and promulgated a regime of universal suffrage, and with all these we have neglected the basic need – that is, a wise and righteous leadership. Some who have gained an inkling of the truth have become frightened at the cry of the rabble and retired into their private sanctuaries, there to enjoy the intellectual pleasures of philosophic mediation. Others have dedicated their talents and wisdom to the enhancement of personal interest in business or profession and have ignored the cry of the populace for a Washington or a Lincoln. In this state of affairs, the people suffer. They are restless and ill at ease. They seek a way out and have no leader. They endure but have no hope. False leaders have arisen. The demagogue and the unscrupulous have asserted themselves. They appeal to ignorance, passion and prejudice and by that means lift themselves into power. They either do not know or do not care for the truth. A just and righteous social order is not their aim. Personal profit and power is the sole purpose of their efforts. Naught care they that havoc nd ruin may be in the distance, so long as they are at the helm. The ship may wreck, but they are the master. The story of the exodus of Israel from Egypt to Canaan is an epic of the experiences of every people. It is pilgrim’s progress from the abode of despair to the celestial city – from darkness and doubt to light and faith. Under the guidance of Moses, they lifted the burdens of the brick yards f Egypt from their backs and led by Joshua, they sounded the trumpets of victory around the walls of Jericho. The revolutionary soldiers marched from the tragic days of Valley Forge to the triumphant hour of Yorktown. But when Moses was on Sinai, seeking the truth for his people, Aaron surrendered to the cry of the rabble and builded for them a calf of gold. And while Washington suffered with the troops at Valley Forge, treason entered the camp to disrupt the hope of the struggling colonies. Thus has the story run in the struggle of the race for righteousness and justice. It is not different now. In the years that have passed, we have overlooked our first need. We have struggled for power as a nation. We have been absorbed in the amazing drama of scientific and industrial process. We erected the expanding structure of our prosperity on a foundation of gold. We deified the intellect and forgot the soul. We builded for ourselves an industrial Frankenstein. We delighted in its perfection and glorified in its power, but we dreamed not of its danger. True to its nature, it turned upon us. There was no pity in it. We said to ourselves that in industrial expansion and financial organization we have brought civilization to a super-stage. The rhytm of the market ticker was more sweet to us than the glorious tones of a cathedral organ. And now, the world is in the slough of despond. The forces of doubt and destruction are attacking the traditions and institutions of society and government. There is a lurid picture but there is a remedy. One of the tenets of Freemasonry is that some must govern and some must serve. This is the nature of human society. The complexities of modern life emphasize this necessity. By specialization we have limited the individual’s activities to a very small sphere. Economic pressure requires that one’s best efforts shall be applied to the thing at hand. We therefore commit to those selected the duty of leadership in established law and justice. By that act, however, one is not absolved from his own obligation. He is bound by every sense of duty and personal need to give intelligent and courageous support to right action and promptly to condemn the wrong. In the race we have run, we have forgotten God, the source of all strength. In the plans we have made, we have neglected Him, whence comes all wisdom.